While house-sitting in bella vista and living out my city-girl life, I met R for lunch at Butcher & Singer to try one of their famed burgers. 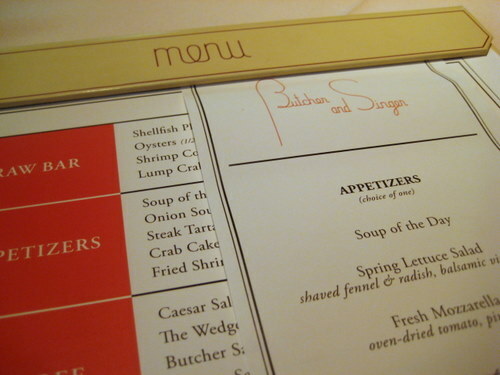 I had no idea how fancy this place was on the inside. I felt pretty bad showing up all schlubby and sweaty after having biked there. But they seemed fine in letting me in. We showed up not during prime lunch time, so it wasn’t all that busy. It seemed that everyone got the burger, so that’s what we did too. And here is the famed Butcher Burger! 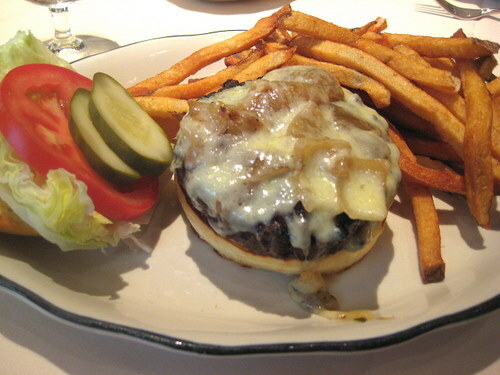 It is topped with english cheddar cheese and a healthy helping of fried onions. You also get iceberg lettuce (yeah! ), tomato, and pickles. And it’s all served with Singer fries. What did I think? This was a great burger! The meat was a tad bit too salty for me (but I don’t like salty things much) but otherwise, it was great. It’s a fat burger, so it’s a bit difficult to eat, but that seems to happen a lot. I also liked the roll, it wasn’t too much bread. And the fries were really good too, almost too good! Service was good. Everyone was nice enough, despite us looking like hobos.